Baking traditions at Ronald McDonald Houses® (RMHC) inspire new heart-shaped cookies at McDonald’s in Canada. McDonald’s Canada is giving Canadians another way to support families at Ronald McDonald House Charities Canada (RMHC) with its newly launched heart-shaped cookie campaign. Now available in participating restaurants across the country, a portion of the proceeds from every cookie sold, every day, will go directly to helping more than 25,000 families a year stay close while their sick child is being treated at a nearby hospital. 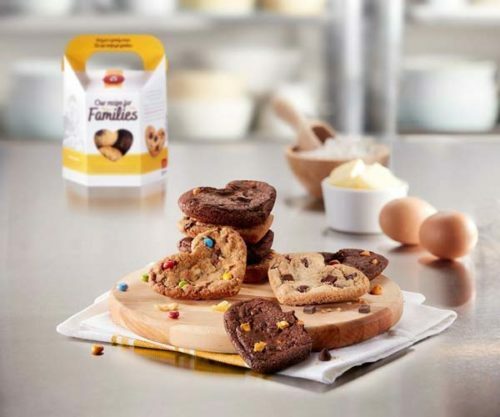 “It was very important to us that RMHC families and volunteers shared the experience of creating this cookie with us, and we’re happy to have a new menu item to support them that holds such meaning and is baked with love,” said Anne Parks, director of menu management, McCafé. The new RMHC Cookies are available in three flavours, including Chocolate Chunk, Lil’ Gem, and a LTO flavour Chocolate Caramel. There are nine different cookie box designs highlighting 13 different RMHC families, with each box featuring two families. For more than 30 years, RMHC volunteers and families alike have baked cookies to help create the feeling of being “home away from home” when families cannot be home. Countless recipes have been used over the years, and each batch of cookies has meant something special.